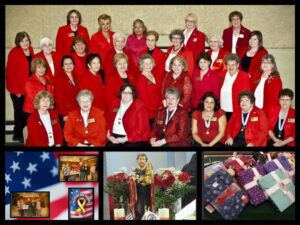 We are considered a “committee” of the Mary’s Millennium Knights of Columbus Council #12801. As such, we stand in partnership with the Knights of Columbus whereby we are a responsibility of, and are responsible to the Knights of Columbus. We function independently and in compliment to the Knights. A Lady need not have a family member participating in the Knights of Columbus. We invite all ladies of the parish to join with us. For the Spiritual and “Living” benefit and enrichment first of the parishioners, their families and the students of St John’s, second for the “World Community” of life, third for the organization of Knights of Columbus and fourth for our country, the United States of America. In the picture above, you see the group of Ladies along with just a few of the many charitable and spiritual endeavors from the past year. Working in conjunction with the Local VFW Post of Streamwood, we Supported our Troops by collecting supplies and donating funds to ship packages overseas. Each year we sponsor the St. Joseph Table which is held following all the masses around March 19th. The ladies bake all the “goodies” which are shared in this annual event. The final image in the collage above was from our holiday “pajamarama”. Instead of giving gifts to each other, we donated brand new pajamas for the Women’s Crisis Center of Elgin, IL. What makes this even more amazing is that all of the 2,740 hours in volunteer time were accomplished by a small band of 45 ladies. Imagine what we could do if we had Just One More Member? Maybe YOU could help make the difference.